However, Culligan was using a payroll service bureau that handled payroll operations for Culligan's 800 Canadian employees. The decentralization of its administrative processes, combined with the service bureau's inadequate functionality and poor reporting tools, created headaches and extra hours for the human resources and payroll staff at Culligan's world headquarters in Chicago. "By centralizing our payroll, we can manage compensation more efficiently," said Mary Odegaard, Payroll Manager for Culligan. "Our best-in-class HCM solution gives us the control and tools we need to do our job well, including preparing reports for day-to-day, compliance, and business intelligence." "With the previous provider, reporting was very limited and was not point-in-time," said Odegaard. "It's great to have such a complete library of reports available with our new solution." The provider of cold-formed fasteners, drive systems, and other engineering services had complex and evolving needs. For instance, managing its new facilities and the associated hiring alongside the seasonal variations in its workforce, which includes virtual employees, demanded an expansion of access to crucial data and a reduction in administrative overhead. The leadership at Semblex found these benefits in unified HCM. With 24-7 direct access for employees and managers through a Web portal, the entire workforce gained the ability to control and modify its own data rather than having to request a change from an external provider. "In many ways, we felt like the payroll service bureau owned our information because we always had to depend on it to handle our reporting. With a unified HCM solution, we own our information and the power, flexibility, and control is giving us so many advantages. We've really elevated the way we work and the way we are managing our workforce," said Todd Switzer, Director of Human Resources at Semblex Corporation. Automatic routing for approvals through workflows streamlined these processes even further. The new cloud-based solution was so well-received by the employee base that Semblex stopped printing paper checks and direct deposit forms altogether-resulting in immediate cost savings. Alongside the ease of use and expanded access capabilities, the manufacturer's HCM solution provided powerful business intelligence tools for reporting and analytics. While its previous system often involved calling a technician on the phone to create or update a specific report, comprehensive HCM allowed the reports to be tailored, produced, and reviewed in-house without delay. "Now, because our unified HCM solution is so easy to use, we can get what we need and have it delivered to internal teams very quickly. The levels of control, speed, and accuracy are big wins for our business. We have a tremendous amount of information that can be made available to executives, managers, and HR teams for strategic analysis and decision-making," said Switzer. The result was a massively elevated level of control and access to information that was critical for planning and decision-making by managers and the executive team. "The levels of control, speed, and accuracy are big wins for our business. We have a tremendous amount of information that can be made available to executives, managers, and HR teams for strategic analysis and decision-making,"
As the third-largest coal producer in the eastern United States, Alliance Coal provides more than 39 million tons of coal a year to the nation's utility plants and industrial users. With mining operations dating back to 1971, the company has grown to more than 4,500 employees in seven states. "To provide you with an idea of how complex we are, our miners can have up to 18 earnings codes in a single paycheck," said Layne Herring, General Manager of Payroll and HRMS at Alliance Coal. "As we continued to expand our mining operations before upgrading our HCM solution, we found it increasingly difficult to update those codes or really make any change in the system. We needed to make enhancements to our technology but were afraid of straining our internal IT, payroll, and HR departments in the process. "The single-greatest value added to our company is the intuitive, easy-to-use technology that puts the software right in the hands of our workforce," said Herring. "We have miners working remotely in 13 locations throughout the Northeast, making it challenging to train all employees at our corporate headquarters. With a user-friendly interface and the array of convenient, online training options, we experience virtually no lag time in getting our employees on this top-notch HCM solution." 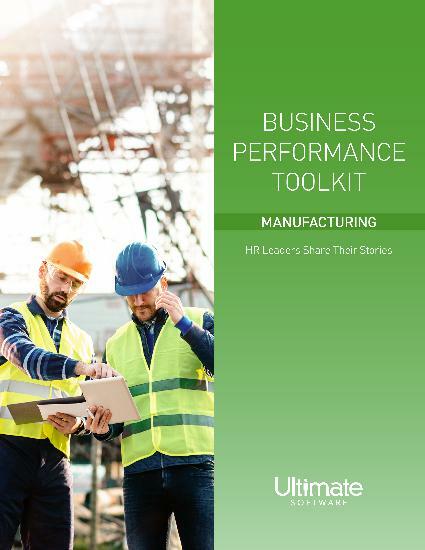 For companies in the manufacturing trade, a flexible, a scalable and powerful HCM solution is a crucial tool for meeting the challenges of the industry. Service bureaus and other providers may provide only a fraction of the functionality and control of unified, cloud-based people management-despite costing more money. On top of that, these options are likely to result in your employee data being fragmented across multiple data sources and tables.